What really matters is not the raw numbers or vanity metrics but the direction and degree of progress. – Eric Ries, ‘The Lean Startup’. Most online services can be cast as having a sticky engine of growth. At it’s heart is the question – “Is the experience rewarding enough for new users to return?”. A model built around this question can help you determine the direction and degree of progress for eCommerce services, creative communities, Saa’Services and many more business models. Three measures come together in this model – Retention Rate, New Customer Rate and Growth Rate. Each measure has it’s own story to tell. If you’ve read ‘The Lean Startup’, you’ll also learn that the model can reveal if your venture has figured out how to leap forward consistently. With this honest a metric at hand, you won’t lose your way. I’ve found the model handy in most of the projects that I’ve worked on. Below is an interpretation of the model and how the three measures are derived. 1. Retention rate: “Customers Retained in Current Period” by “Total Customers”. 2. New Customer Rate: “New Customers” by “Total Customers”. 3. Churn Rate: “Customers you failed to retain” by “Total Customers”. 4. Growth: is the difference “New Customer Rate” – “Churn Rate”. 5. 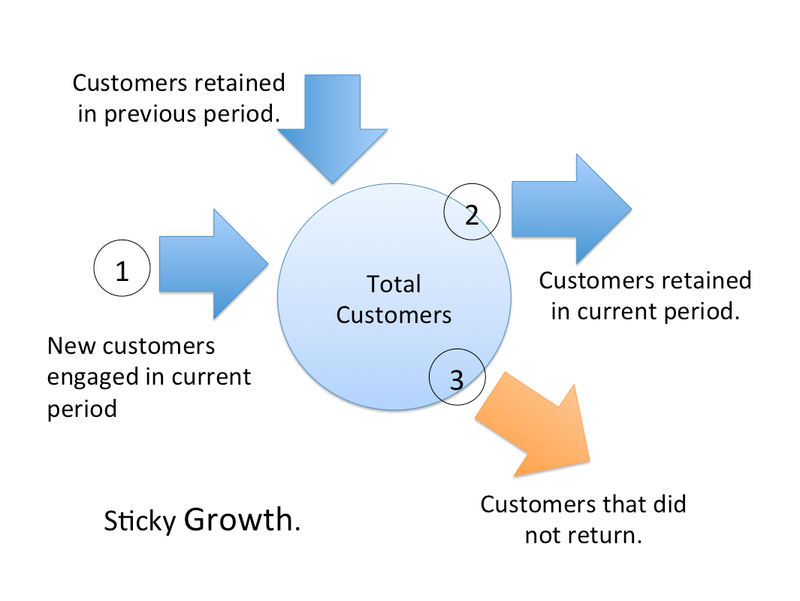 Total Customers: coming into a period are the Customers Retained in the previous period and New Customers you will engage in the current period. * When Retention Rate is 100%, Churn Rate is zero. * When New Customers Added = Customers Retained in the same period, Growth is 100%. * When Retention Rate is zero, Growth is negative for that period. * When New Customers Added is zero, Growth is less than or equal to zero depending on the Churn Rate. Thanks to Mitesh Bohra, CEO at Savetime.com for lending his time to whet iterations of the model. Do leave your feedback in the comments, especially if you have a different interpretation to share. Very good, thanks very much. I did not fulfill understand the model when reading the Lean Startup book and this definitely solved my doubts.